Perhaps you're in the process of moving and need a place to store your personal and valuable belongings while you're between homes. Or, maybe you simply don't want to store expensive or sentimental items in your home. Whatever the reason you're considering storing valuable items – either those that are expensive or those items that are simply priceless to you – there are some things to consider when packing your belongings. Photographs and sentimental paper items: Don't shove your photos into a box and call it a day. Doing this could lead to wrinkled and bent photos. Instead take the time to put them into photo albums; ones with archive quality paper are best. If you don't have the time to sort and put them into albums invest in specialized photo boxes that will better protect your special memories. Breakable items: All fragile items, including ornaments, knick knacks, china, and glassware should be wrapped in bubble wrap and packed tightly into sturdy boxes. If you have space left in the box, fill it with paper or bubble wrap. You don't want the items in the box to bump against other items and break. Clothing: Leather coats, couture dresses, or even your best suit should all be cleaned, treated if appropriate, stored in wardrobe boxes, and hung on a hanger. Doing this ensures that the clothing items hold their shape better. Electronics: When possible, pack your TVs, radios, computers, and other electronics in their original boxes. If, like many people, you threw away the box for the TV a long time ago find the best fitting box available and use packing filler or newspaper to ensure a secure fit. Furniture: You can fit more items into your self-storage unit if you take the furniture apart. Stack your chairs and store large items vertically to save space. If you have wood furniture, treat it with furniture spray prior to storing and utilize covers to minimize collecting dust and scratches. Utilizing these tips and choosing a self-storage facility that provides protection for your valuables gives you the peace of mind to know that your personal items will be safe and secure while they are in storage. 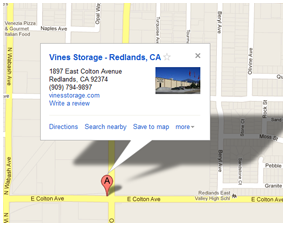 At Vines Storage Center in Highland, CA, our storage units are monitored, our renters have 24/7 access, and the temperature in the units is controlled. Call us today for more information.